It’s been an exciting term for the Admission & Advancement Team. We have welcomed new families and met many prospective candidates while ensuring that the transition back to school was a smooth one for all! With our number of applicants at an all time high and with most grades at full capacity for 2018-2019, we are now focused on enhancing the quality for each and every one of our 675 students at The York School. What is The York School Fund? It is time for us to dream bigger and achieve more. That’s why we are excited to be launching our revitalized annual giving program to our community next week. The York School Fund is designed to engage and inspire our community to help our students shine brighter while supporting the mission, vision and values of The York School community for years to come. To consider where your giving will make the most impact, please check your mailbox next week. The York School Fund package will highlight areas we hope will spark your interest in supporting the school. Many families have already stepped forward in support of the school this year and we thank you for your leadership and generosity. Every donation to The York School Fund will translate to an even better student experience. We have never been stronger as a school and I hope you will make a commitment to dream big with us. Every gift received by December 31 is eligible for a 2017 tax receipt. 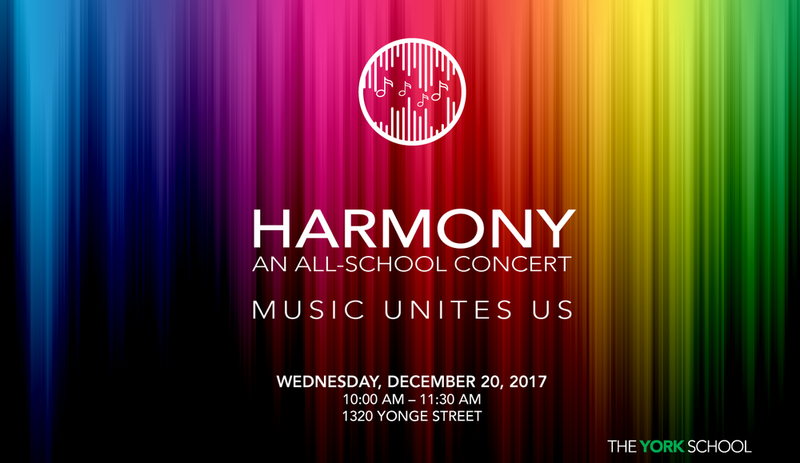 Please join us for Harmony – Music Unites Us on December 20, 2017!